The Alabama Forestry Commission is committed to offering all possible assistance to volunteer fire departments (VFDs) to better provide fire protection for citizens throughout the state. A strong partnership between VFDs and AFC personnel is a key part of our wildland fire prevention and suppression efforts. This assistance includes pursuing funding opportunities available to VFDs, as well as providing training and equipment to these departments. Certification: Alabama Code, Section 9-3-17, Authorizes and directs the Alabama Forestry Commission to certify Volunteer Fire Departments (VFDs). VFDs must meet the minimum requirements as identified in the Alabama Code (reprinted below). Currently, there are more than one-thousand certified VFDs in Alabama. 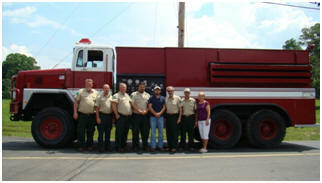 Contact AFC’s Statewide VFD Coordinator if you wish to be inspected for certification. State Coordination: AFC works jointly with the Rural Community Fire Protection (RCFP) Steering Committee with the purpose to discuss issues and improve the rural community fire program and solve immediate problems including parts exchange, training, and financial assistance. The group also makes recommendations for proposed legislation that will improve emergency services to the citizens of Alabama. The makeup of this committee is according to Alabama Code,Section 9-3-12. Wildland Firefighting Training: AFC provides several training opportunities annually for volunteer fire department members to be trained under national NWCG Standards as Wildland Firefighters (FF2). Training is offered to volunteer fire departments by two different methods to accommodate as many volunteer firefighters as possible. The training is offered in a traditional classroom setting, and also by way of a computer-based self-study version administered and monitored by AFC instructors. VFD Radio Communication Support: To provide communications support to VFDs, years ago AFC installed UHF radio systems that VFDs rely on in 39 counties in Alabama (view map). This has taken a dedicated staff of radio technicians tremendous time and energy to travel to these counties 24/7 when the system experiences technical difficulties. The state has spent millions in equipment purchases to maintain these systems. State Financial Support: The Alabama Legislature appropriates funds and directs the Alabama Forestry Commission to administer the program and distribute funds to every active volunteer fire department in Alabama. Fire departments must use these funds in accordance with the Alabama Department of Examiners of Public Accounts’ Financial and Compliance Guidelines for Volunteer Fire Departments. Approximately one million dollars are distributed to approximately one thousand fire departments each year. Federal Financial Support: The Alabama Forestry Commission applies for and periodically receives national fire protection federal grants through the USDA Forest Service on behalf of volunteer fire departments. Over the last several years (2011-14), AFC has transferred $311,978.00 to 119 different volunteer fire departments in Alabama to purchase training, personal protective equipment, and wildland firefighting equipment. Fire departments have also trained more than 500 volunteers in Wildland firefighting techniques. The primary goal of the Assistance to Firefighters Grants (AFG) is to meet the firefighting and emergency response needs of fire departments and nonaffiliated emergency medical service organizations. Since 2001, AFG has helped firefighters and other first responders to obtain critically needed equipment, protective gear, emergency vehicles, training and other resources needed to protect the public and emergency personnel from fire and related hazards. The Staffing for Adequate Fire and Emergency Response (SAFER) Grants was created to provide funding directly to fire departments and volunteer firefighter interest organizations to help them increase the number of trained, "front line" firefighters available in their communities. For additional information, visit FEMA's webpage. Issue Federal Excess Property: Through a cooperative agreement with the USDA Forest Service and Department of Defense, AFC is authorized to obtain federal excess property to use for fire control for both AFC and VFDs. Typically, 2.5-ton and 5-ton federal excess property trucks acquired are re-manufactured into wildfire tanker trucks that provide vital water to rural areas where fire hydrants do not exists or are sparse. 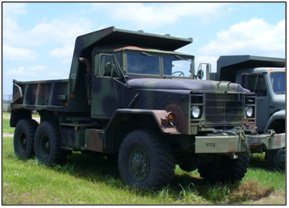 Other equipment includes certain models of grass trucks, transports, trailers, and generators. Some of this property is on loan where the federal government keeps the title and ownership. This property must be returned when no longer used for fire control. Ownership of other federal property is transferred to AFC and then to VFDs as long as the property is put “in service” for fire control or other emergency service use. State Foresters and the USDA Forest Service have mutually participated in the federal excess property program since 1956. The AFC distributes this property to VFDs in an orderly and transparent manner based on VFD requests and needs. In 2014, Alabama had 425 federal vehicles valued at $11.8 million issued to 306 volunteer fire departments that are being used for emergency response. During the last few years, several fire department stations were damaged or entirely destroyed by tornados, floods, or fires. Through the federal program, Alabama was able to provide these departments with replacement units so there was limited interruption in the department’s response to their communities. Just since the beginning of FY11, the Alabama Forestry Commission, working in partnerships with the U.S. Forest Service and Department of Defense, has screened and acquired 63 transports/tankers, 85 grass trucks, and 41 other vehicles, such as box trucks to use as rescue units. During the same time period, the Commission has transferred 104 vehicles to use for emergency response to volunteer fire departments and county offices. 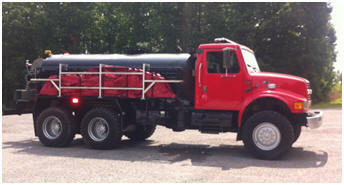 Shown below are two federal property vehicles recently screened that can be converted to tanker trucks. 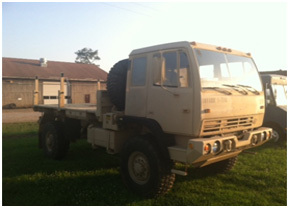 Shown below are two federal property vehicles that volunteer fire departments have placed in service. Volunteer Fire Departments may request a federal vehicle or other property by completing the following form and submitting it to their local Alabama Forestry Commission office: FC-42 RCFP Equipment Request Form. Click Here for additional Information regarding the USDA Forest Service - Federal Excess Property Program.